Hello everyone! 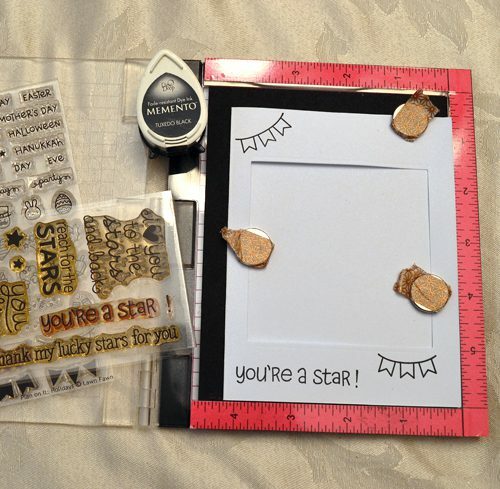 I am so excited to share a window shaker card created with Keepsake Envelope Mix as an easy shaker feature. This card was a make and take project during the Creativation 2017 (formerly CHA – Craft &amp; Hobby Assoc.) trade show in Phoenix AZ last month. Let me show how to create this fun interactive card! 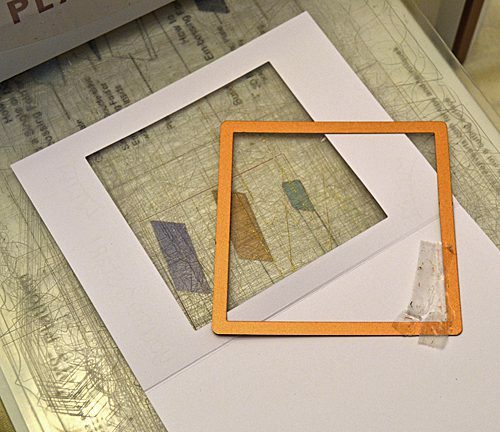 To make the card base, die-cut a square on an A2 (4.25 x 5.5 in) size card front to create a window/opening. Stamp banner and sentiment. Color the banner with watercolor pencils. Set aside. 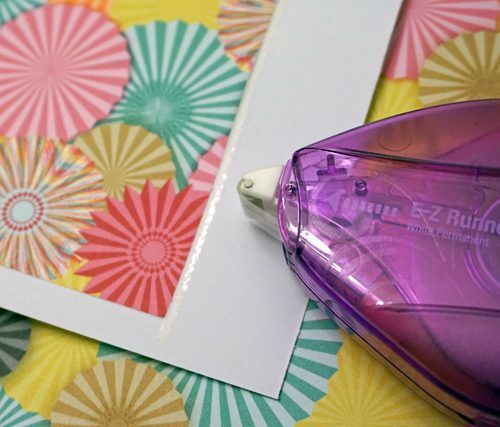 To make the shaker feature, cut patterned paper to fit inside a large Keepsake Envelope. 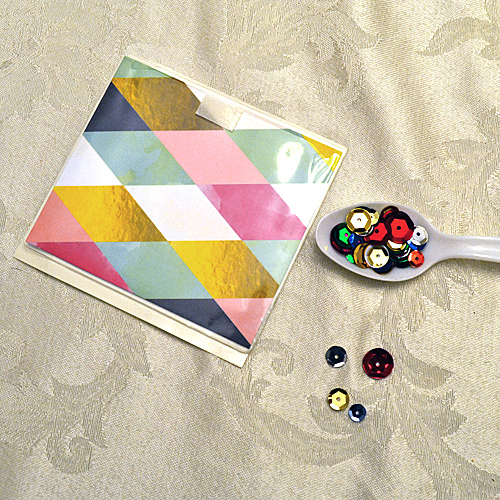 Scoop enough sequins to fill the spoon’s bottom and place in front of patterned paper, inside the envelope. Take out four sequins to use on the card front later. 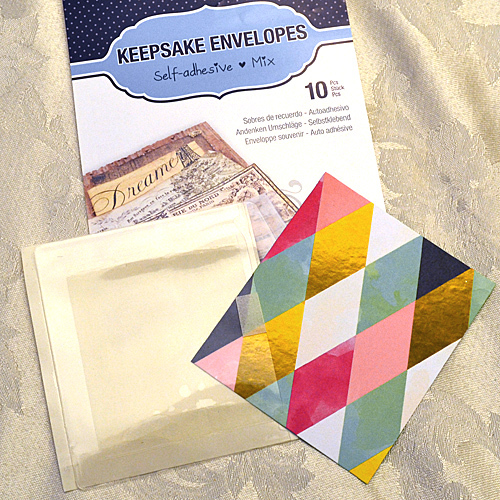 Take the liner off on the front of envelope and close the flap. Set aside. Apply the E-Z Runner® Micro Refillable Dispenser close to the inside edge of the window as possible (to secure in place). 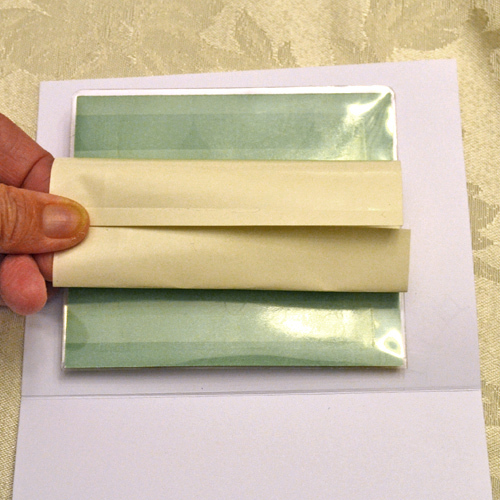 Curl the ends of the Keepsake Envelope liner together to make a “handle” for easy placement over the window. 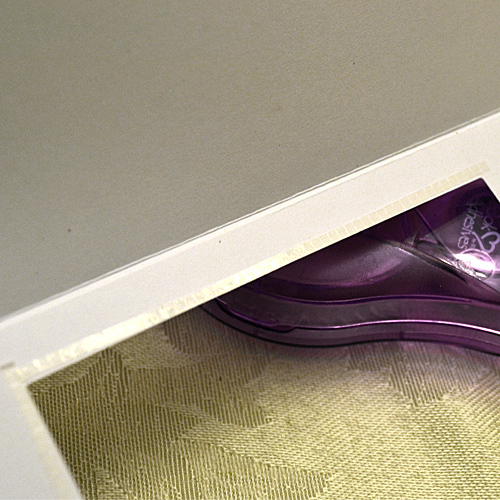 DO NOT REMOVE THE LINER YET – use it to press down the adhesive edges together to secure. Add white cardstock panel to cover shaker by applying E-Z Runner® Grand Dispenser (you can use your E-Z Runner® Permanent Strips too) on the edges of cardstock. 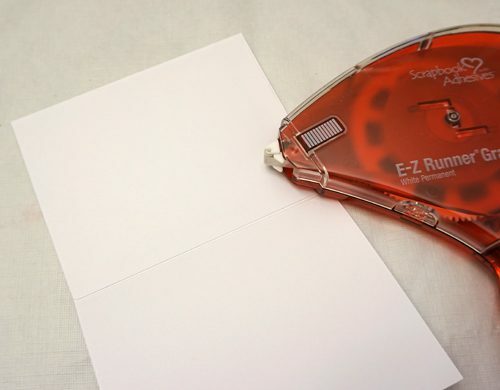 Remove liner of Keepsake Envelope and place white cardstock over to cover the entire back cover of card. Now for the fun part, embellish card front! Pull out the points of largest 3D Foam Star FIRST gently with a tooth pick WITH LINER ON (helps keep its shape). Place on top of the shaker in any way (straight, angle, etc.). 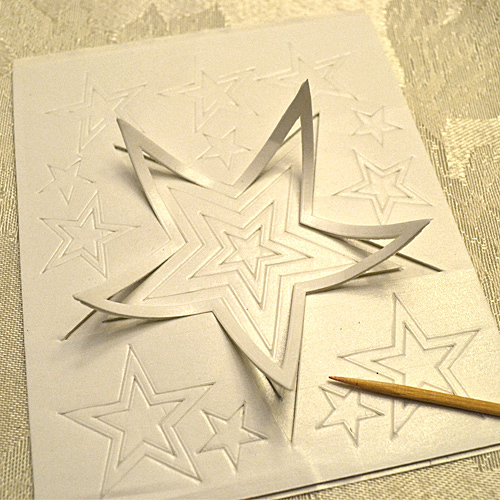 Remove the liner from the 3D Foam Star and place the foil shiny side up. Gently burnish into the star with your finger and lift the foil. For the finishing touch, add your sequins to accent the card front with a combination of Adhesive Dots Mini and new Adhesive Dots Micro. This entry was posted in 3D Foam Shapes, Adhesive Dots & Lines, Adhesives, Cards, Crafts & Tutorials, E-Z Runner® Dispensers, Embellishments, Keepsake Envelopes, Tutorial, Wear your Adhesive on the Outside and tagged 3D Foam Holiday Embellishment Kit with Foil, 3D Foam Stars, Adhesive Dots Micro, Adhesive Dots Mini, Birthday, Bo Bunny, E-Z Runner Grand Dispenser, E-Z Runner Micro Refillable Dispenser, E-Z Runner Permanent Strips, E-Z Runner Permanent Strips Refillable, E-Z Runner Permanent Strips Refillable Value Pack, IMAGINE Crafts/Tsukineko, Keepsake Envelopes, Lawn Fawn, Margie Higuchi, My Sweet Petunia, Photo Play Paper Co., Shaker Card, Tutorial. Bookmark the permalink. 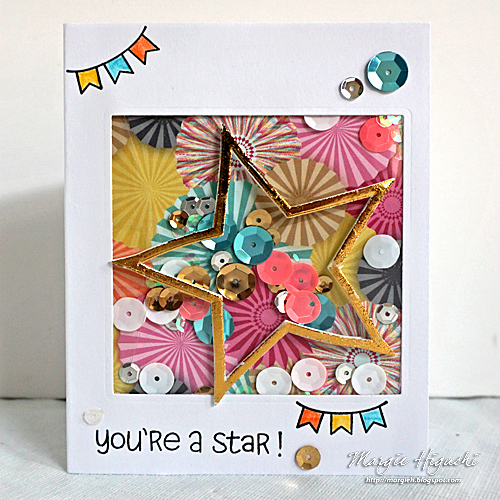 2 Responses to "You’re A Star Shaker Card Tutorial from Creativation 2017"
So fun, everyone had a great time putting this MnT together. Love this card so happy and fun! Love all the colors as well.